Quality and value are perfected by materials, discretely designed lines, top quality shelves and numerous other functional improvements.. Intensive air circulation leads to steady and even temperature throughout the refrigerator compartment. Compared to conventional systems, MultiFlow cools the food more efficiently, keeping the freshness, aroma, and nutrients of fruit, vegetables, and meat much longer. FreshZone - Fresh as if straight from nature: The drawer with the lowest temperature in the refrigerator is ideal for storing meat, fish, fruit, and vegetables. ION generation of fridge freezers definitely positions Gorenje among top brands on the market. Quality and value are perfected by materials, discretely designed lines, top quality shelves and numerous other functional improvements. 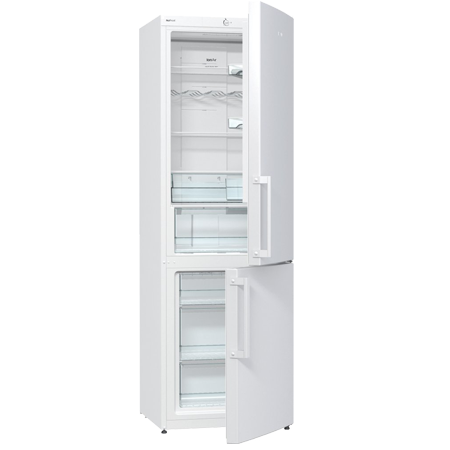 Deep door bottle shelf: Refrigerator door has plenty of storage for the largest glass or plastic bottles. A special fence holds the items in place to prevent it from moving and damage while the door is opened or closed. CrispZone drawer featuring HumidityControl - Just like garden-fresh: CrispZone is one of the largest fruit and vegetables bins in the market. Low temperature and the option to adjust the humidity extend the freshness of your produce. XXL SpaceBox - Enough space to store a turkey: This freezer compartment drawer is the largest in the appliance and it is ideal for storing large items like a turkey, several pizzas, or even cakes. NoFrost system is ideal for the freezer. A fan inside the appliance blows cool air based on principle of air conditioning - without humidity. No humidity means that there is no ice. Pay an initial 10% Deposit of £42.00. A £29 settlement fee is payable at the time of final payment. Settle the balance in 12 months interest free.